Look at all that corn! Prior to visiting McDonald's Taiwan in order to review the Beef+Salmon Burger and Seafood balls, I took a quick visit to their official website to see if I could find any discount coupons for what I planned on ordering. Although they didn't have any for the burger, I did find a $10NTD ($0.31USD) off a small corn soup. I had planned on ordering a soup anyway, so I could give it a proper review, but more so that my wife could finally try it, as she's a huge fan of the breakfast soup in Hong Kong, I thought she would enjoy this as well. 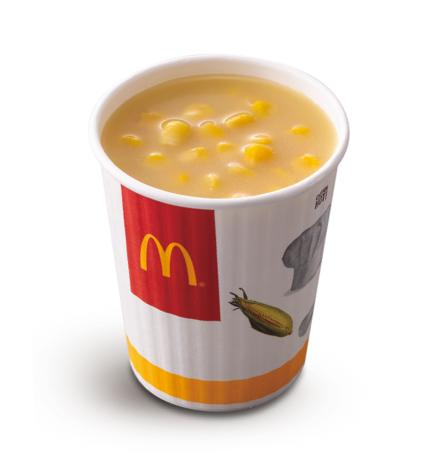 The first time I had McDonald's corn soup was when I visited Taiwan in February 2007. I also tried it again in subsequent visits, but I never was able to try it since I've been writing this blog. What was also new to me this time around, was that it was offered in two sizes, small and large. I'm not totally sure if this is new as previously I had substituted my fries for this soup which meant I always ended up with the significantly larger size (what would now be considered a large). Since my coupon was for a small cup, I went with that. I was a little surprised to find that the small, meant a small coffee cup full of soup, complete with the drinkable coffee lid! I guess it's smarter (and eco-friendly) to simply reuse the packaging they already have designed and on-hand, but I thought it was funny that you could theoretically be walking down the streets of Taipei, unsuspectingly drinking hot corn soup out out of a coffee cup. This would actually be rather wonderful if Taipei actually had a cold winter, but we were visiting on Christmas Eve, and it was a sunny +20 outside - noticeably cooler than here in Singapore, but warm enough you needn't covertly drink soup to stay worm. It would have been great just two days prior in Korea, where it was -16 the morning we left. The even bigger disappointment was the taste! My memory of the corn soup was that of a cream-of-corn-esque soup full of corn kernels, and a hearty, creamy taste. But this was the complete opposite of what I remembered, it was VERY watery and had next to no corn kernels inside! Yes, it did have the correct corn-yellow hue to it, but if you didn't happen to get any actual kernels of corn on your spoon, you'd be hard-pressed to taste any corn at all. I swirled my spoon around the cup in search for corn but in the entire cup, there were probably around 10 or so kernels, hardy enough to make the soup hearty, and even at the discounted price, hardly worth the price. Before, I would always swap my fries for corn, but if this is what the soup has become, I'll just stick with the fries for now on.